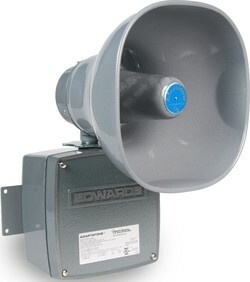 The Edwards 5531MV Adaptatone Millennium Voice unit is a heavy-duty industrial, tone-selectable, signaling device capable of producing volume-controlled, high-decibel tones and up to 20 seconds of field recorded voice messages. The Adaptatone Millennium Voice unit can be activated from field-wired, normally open contacts, or a 24VDC or 120VAC external voltage source such as an output of a PLC. Normally open contacts can be obtained from the Cat. No. 5538-4 and/or Cat. No. 5538-4R Adaptatone Signal Actuators. The unit uses a microprocessor circuit to create 55 distinctive tones and store 20 seconds of field recorded voice messages. Messages and tones may be selected by setting miniature dip switches within the unit. A total of four messages and tones programmed operate on a pyramid-type priority system. For more information on priority tone operation and a complete listing of all 55 tones, see the catalog pages listed on the left hand side of this page. The 5531MV is designed for either 1/2" (13mm) conduit or surface mounting. See Adaptatone Signaling Installation in the catalog pages on the left hand side of this page. Designed for industrial applications including emergency warning, plant evacuation and security alarms, process monitoring, shift notification horns, paging and process control.